Machine wash. Tumble dry. 100% cotton. These Stylist Kitchen Dining Table Placemats highly update your dining table and kitchen decor. Available in brown color. HEBE vinyl placemats are washable,easy to clean and dries very quick,you can roll them up or slide them between things while you clean the table. (Box is not included). 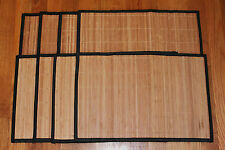 Lot of 8 Bamboo Place Mats. Lined fabric back - see 2nd picture. Synthetic black fabric edging. 100% Cotton, Quilted with Scalloped Edges. Machine wash cold. Tumble dry low. 100% reversible to a blue on white. Set of 2 matching placemats. Machine wash. Tumble dry. 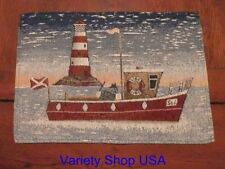 · Includes 4 placemats. · Stain resistant; wipe with a damp cloth for easy cleanup. Rich with a multitude of shades and infused with sun-dried water hyacinth stems– colors vary slightly from one to another and in different lighting! Newest Placemats Set of 6 Gray Tableware Dining Kitchen Modern Design PVC Mats. April Cornell? Set of 4 Place mats Yellow Green Blue Floral Paisley 14" x 19"
Paisley Batik style, April Cornell??. New, never used, Pretty either way. Care Instructions: Machine Washable, Lay Flat or Line Dry, Warm Iron As Needed. Neutral tan coloration creates a versatile look that coordinates with endless styles. Manufactured and sold only by Olivia's Heartland. 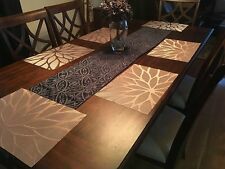 Set of 6 placemats. - White color. - Don't forget our matching table and hand linens. Set of 4 Foam Backed Placemats Spring Floral & Love Birds 18" x 13"
Design has Pink Flowers and 2 Adorable Love Birds. 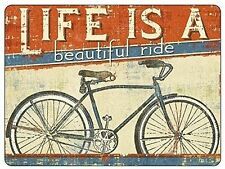 Stay in Place- Skid Free. Vinyl Black Place Mats Heat Resistant for Dining Table Kitchen Non-Slip Washable PVC,Set of 6. Great for indoors/outdoor, all year long for your dining room or kitchen. Included are 4, 13" x 19" matching placemats, woven 60% cotton,40% poly tapestry, nice finished edges all around Gorgeous natural colors, Yellow, brown, and green on a cream background. The placemat is 100% pre-washed cotton and machine quilted. 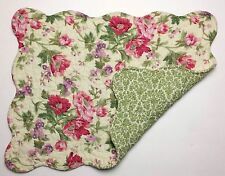 The scalloped placemat is 13"x19". The TAPESTRY placemats have HAPPY HARVEST with a scarecrow arms spread and baby scarecrow between the legs. This has fruits, vegetables, flowers and the sun in the sky with leaves blowing through the air with a picket fence in the background. 2 Red White Tan Paisley Rectangular Reversible Fabric Placemats. Fabric is stiff. 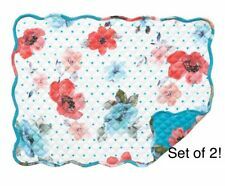 Set of 4 reversible placemats. One side of the place-mat has different size red,blue and white stars. The white stars have silver glitter on them probably so it can show up on the white background. Trending at $33.94eBay determines this price through a machine learned model of the product's sale prices within the last 90 days. Set of 4 Damask Table Placemats in green. Condition is New with tags. Shipped with USPS Priority Mail. Sets of 6 Silver Table Place Mats Washable Hotel Non-slip Placemats 18 x 12In. Material: PVC. When encountering with force majeure, the processing of orders will be delayed. Nevertheless, it is ensured that your order will be processed in a fast manner when weather permits. Color：As the picture. Machine washable, line dry to avoid shrinkage. Set of 2 FLEUR DE LIS JACQUARD STRIPE Cotton Placemats 14" x 19"
Jacquard woven 100% cotton placemats are fused and lined. 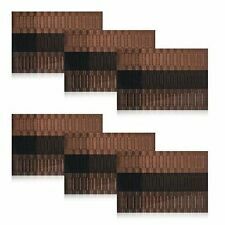 Set of 2 matching placemats. Hand wash. Lay flat or line dry. Kitchen & Dining Textiles. Black Coffee By Park Designs. Pattern: Black Coffee. Color: Black & Tan. Machine Washable ~ Follow instructions on label. Sold Individually. Trending at $8.95eBay determines this price through a machine learned model of the product's sale prices within the last 90 days. 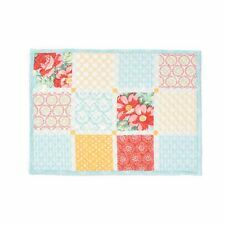 The binding on these beautiful placemats with quilt block pattern can be refinished to fit your preference or used as is. 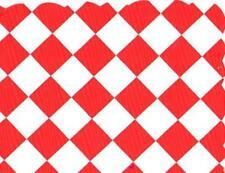 The quilt block style patterns is nicely evenly spaced. Set of 4 Hearth and Hand Magnolia Coral White Placemats. Features a cork backed placemat with a very elegant design. Manufacturer: BENSON MILLS. Add style to your dinner party with these luxurious printed cork placemats. Protects your table, while bringing elegance to the dining table. A marvelous100% cotton table placemats printed withgorgeous kalamkari design on white base. This table placemat features subtle gorgeous red blue & black kalamkari floral design on white base. Washing instructions. Your friends will ask you where you got such a cool placemats set. Color:4 Pcs Red. Easy to use and take care, easy to clean. Direct water scrub, do not fade, not mildew. Clear Acrylic Placemat or table protector. Condition is New, Unused. These acrylic placemats are laser cut from 1/8" clear acrylic sheets for safety. Great for indoors/outdoor, all year long for your dining room or kitchen. Included are 4, 13" x 19" matching placemats, woven 60% cotton,40% poly tapestry, nice finished edges all around Gorgeous natural colors, BLUES, BROWN/GREENS, on a cream background, blue check borders.